Resorting to Google Apps for Work is usually not enough for your business to scale up. Naturally, at the most basic level, you should combine them with other cloud-based solutions in order to help your online business operate uninterruptedly. Thus, in the wake of business virtualization, Google Marketplace is constantly expanding and upgrading in order to meet all the requirements of modern IT infrastructure management. Here are some of its latest upgrades that might be essential for your business. Moving to Google Apps for Work might be the first step towards building solid IT infrastructure, but it is definitely not the most important one. Moreover, only when combined with other cloud solutions it can become the backbone of your online business. 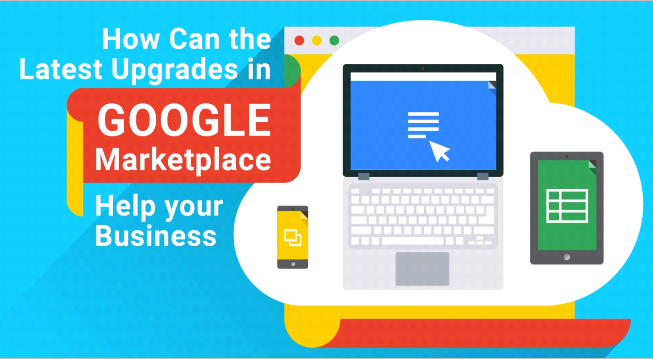 Google Marketplace continues to proliferate, it gets more and more difficult for companies to choose cloud services that can properly support Google Apps. Getting caught up in the excess of tasks regarding the IT infrastructure management, businesses usually have neither resources nor time to thoroughly test all the apps from the Marketplace for their credibility. Seeing this issue as a potential roadblock for businesses that are planning to move some of their vital resources to cloud, Google announced the ‘Recommended for Google Apps’ program. More precisely, in order to help you and your employees experience the most from the cloud, the company has started assessing the applications from other providers in order to make sure that they meet the highest security and quality standards. The main idea behind cloud solutions is to improve the information flow, data storage and workplace collaboration. This is exactly what Google had in mind when it launched “Recommended for Google Apps.” As mentioned above, each application recommended by Google helps you manage some of the most critical fields of your business. Drive more sales with ProsperWorks for CRM. One of the major goals of cloud computing is to provide your employees with flexibility, real-time collaboration and user-friendly work environment. Namely, the integration of ProsperWorks with Google Apps will enable you to close more deals, visualize sales pipeline and track customer activities. Make your team always available with Smartsheet. As a business owner, you need to observe, guide, organize and manage. With Smartsheet, you will manage to integrate the simplicity of Google Apps with the most innovative project management solutions. Optimize your communication requirements with RingCentral and Switch. In the hyper-connected world, bringing together all smart devices is one of the greatest challenges for businesses. Precisely for this reason, cloud-based phone systems have started gaining ground as one of the most effective ways for companies to optimize their needs. For instance, RingCentral or Switch enable you to manage your SMS conversations, expand Google Hangouts capacity, schedule online meetings and receive calls on all your mobile or desktop devices at the same time, as well as switch between them. Manage your documents with AoDocs and Powertools. Combined with Google Apps, AoDocs and Powertools will help you organize your data and yet preserve the cost-effectiveness, mobility and ease of use of Google Drive. Protect your files in Google Drive with Ping Identity and Okta. Parallel with the growth of IT infrastructure, the likelihood of potential privacy breaches rises, as well. Tightly integrated with Google Apps, platforms like Ping Identity and Okta will provide all your files with identity integrations and secure access, single sign-on for both public and private cloud applications. The age of virtualization has definitely revolutionized the way businesses manage their IT infrastructure. As it can be concluded from the mentioned examples, being savvy with storing and accessing company’s workload requires a wide range of cloud apps that optimise different aspects of your business. Still, although they facilitate the information flow and workplace collaboration, such cloud-based services shouldn’t be taken lightly. Consequently, with the growth of business and consumer applications, companies keep facing numerous technical challenges. Parallel with improving the workplace productivity and workload mobility comes a set of passwords and usernames each of your employees needs to enter in order to access the information stored on cloud. Seeing this issue as one of the most critical aspects of mobility management, Google has started pushing the boundaries of data security with its upgraded version of Single Sign-On (SSO) services. Unlike its previous version, where a third party SSO was an identity provider, now Google Apps takes on this role. Attempting to help your employees log in to different applications via multiple devices by authenticating only once, Google Apps’ credentials now help you avoid unnecessary passwords or licenses. Finally, you don’t have to be an experienced marketer to see that the latest Google’s updates will soon reach their new pinnacle in terms of the efficacy of cloud apps. Directly correlating with the ever-increasing need for server virtualization, Google Marketplace is continuously undergoing numerous modifications in order to meet all requirements of web-based companies. Since it is predicted to keep evolving in such a rapid pace, one thing is indisputable- soon, businesses will be provided with the opportunity to integrate a completely new form of IT intelligence with their existing infrastructure.